As outlined above it is essential that you can make a number of instantaneous readings across the enclosure to establish if you have the right temperature gradients. 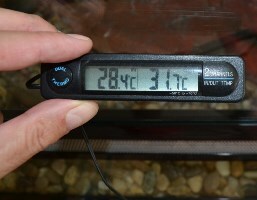 One of the problems with using a standard mercury thermometer is that it takes time to get a correct reading, and you can’t get an instantaneous reading elsewhere in the tank. 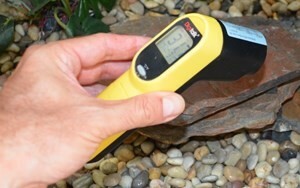 An essential piece of equipment to accurately and quickly determining temperature is an “Infrared Thermometer gun” (see photo). You simply point the gun to a spot, a red laser beam hits the target and you get an instantaneous reading. 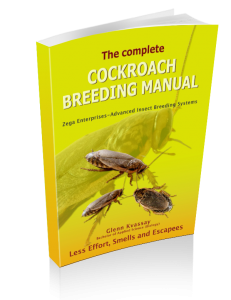 You can quickly get an understanding of the heating of your enclosure by taking multiple reading across the whole enclosure, under the heat source and of your reptile directly. Never rely on a thermostat to maintain the correct temperature, regularly check the background temperature with a thermometer gun and a digital thermometer. Most will have a sensor which reads the temperature within the enclosure, and provides an ambient (background) temperature. 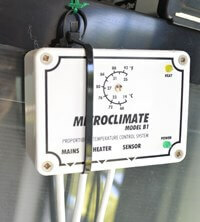 A thermostat regulates temperature in the enclosure by turning itself on and off when temperatures get too cool or too hot. Generally there are two types. 1) Switch thermostat. These switch on and off to regulate the temperature. 2) Dimming or variable thermostats (see below photo). These adjust the electrical current to the heating device (usually a globe or heat mat) which then increases or decreases the intensity of the heating device. If the heat is not required they don’t unnecessarily produce more heat. These are far more energy efficient and increase the life of bulbs. In a normal thermostat damage is caused to a bulb as it turns on and off, resulting in frequent cooling and heating cycles (shrink and expansion). 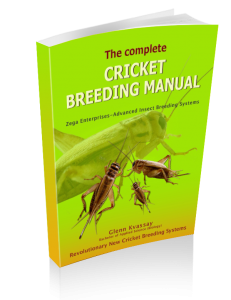 The following section describes why choosing the correct enclosure is important to maintain heat gradients and to reduce heating costs. 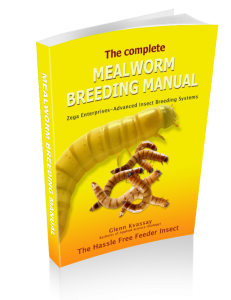 To learn how to breed feeder insects for your reptile click here.